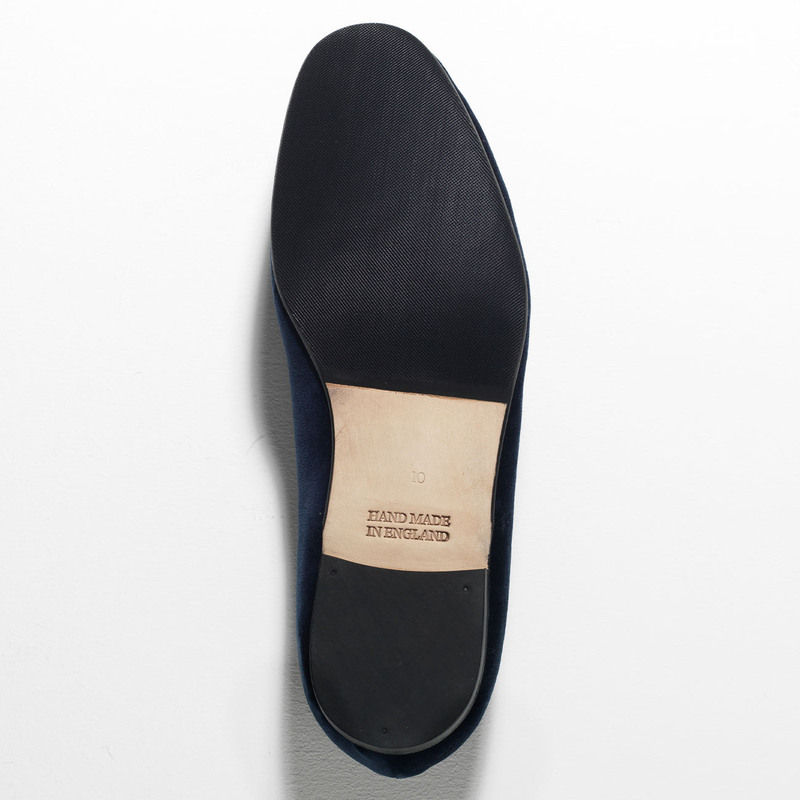 Complementing its tuxedo, A Socialist presents a special pair of room shoes fabricated by an English shoemaker with 150 years of proud history based in Norwich, England. All fabrications were performed by hand following traditional styles reserved for Royal and aristocratic families, but a plain sensibility was bravely mixed in with this order to create a readily wearable design. 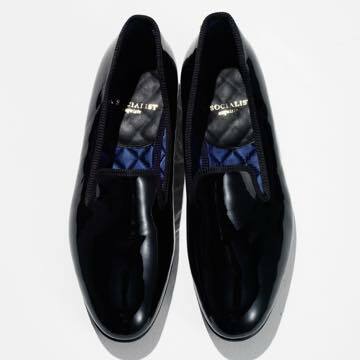 The beautiful luster of the black patent leather reminds one of the still surface of a midnight lake; it goes without saying they are perfect in a formal scene, worn like slip-on sneakers with bare feet, however, they can also be appropriately unorthodox additions to casual apparel. 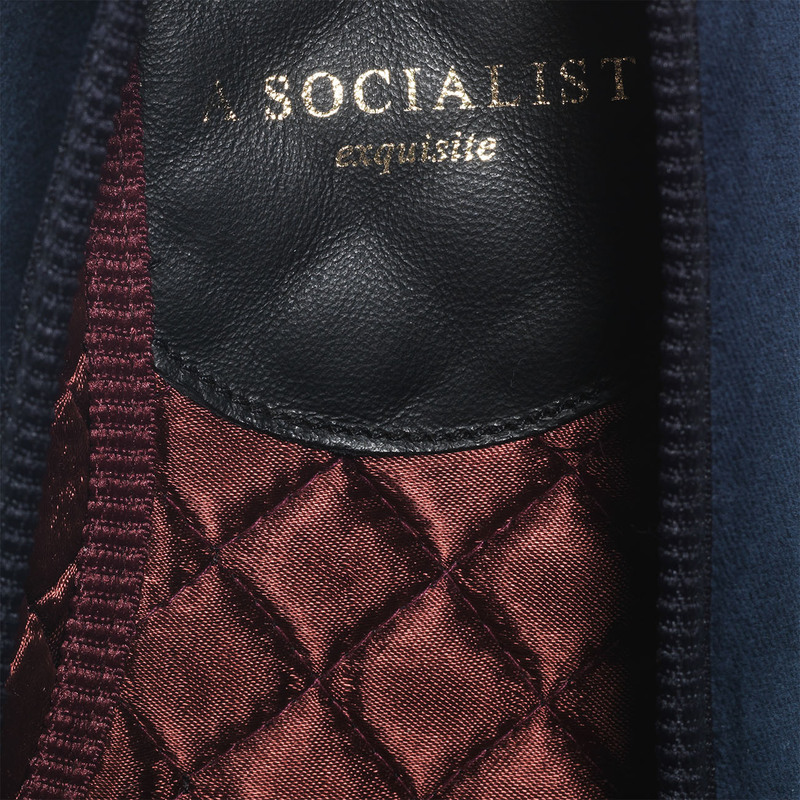 The quilted satin lining feels superb even when worn with bare feet. 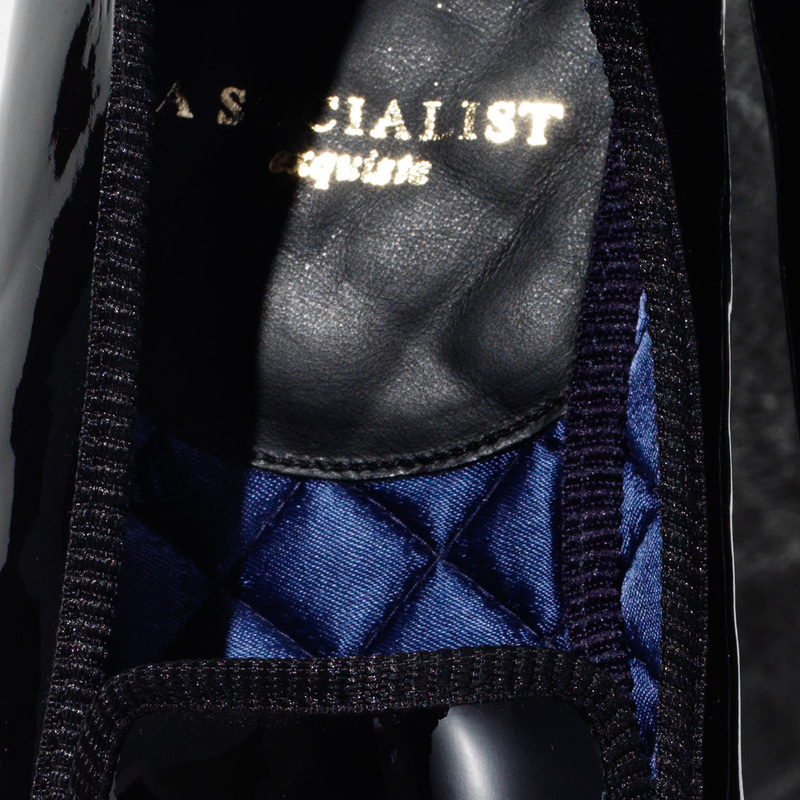 The weight bearing heel portion features leather embossed with the A Socialist brand logo. 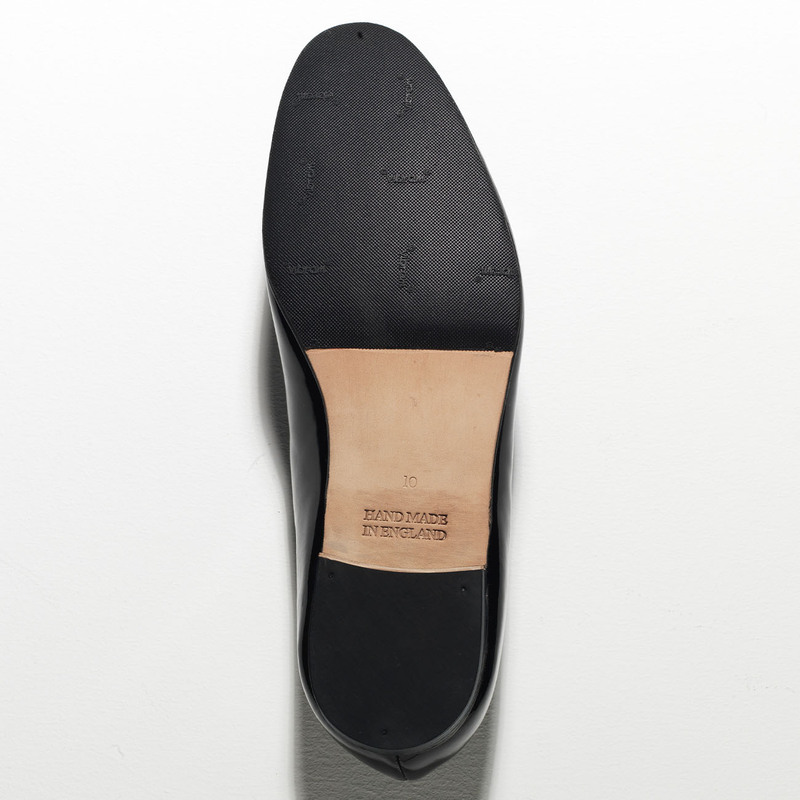 In a departure from traditional room wear roots, a Vibram® rubber sole was added to the leather sole making the shoes not only compatible for outdoor use but grippy on asphalt and highly durable. 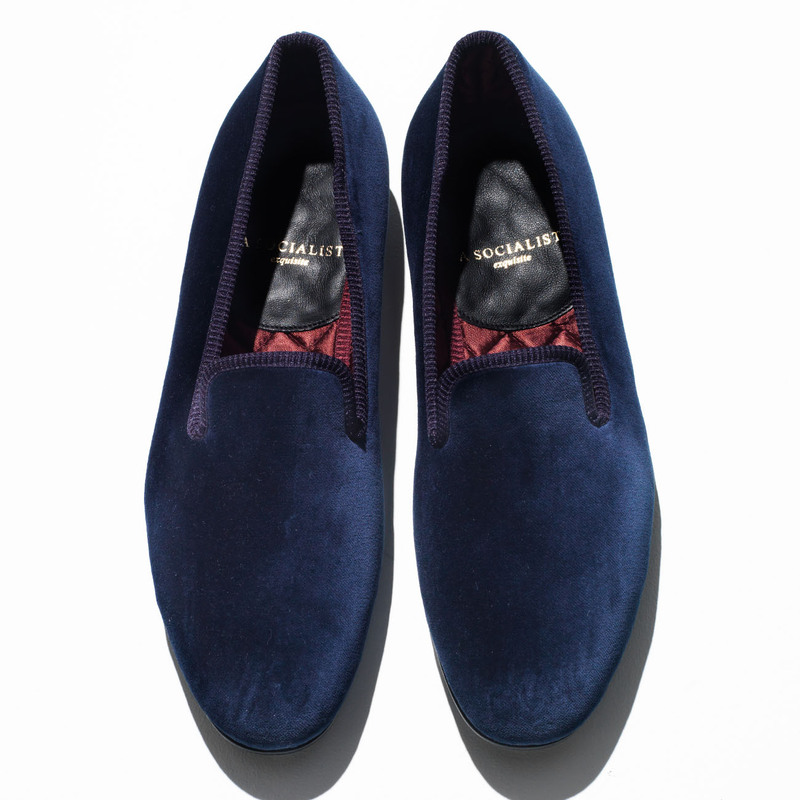 The deep blue velvet model is a best match for the blue velvet tuxedo, but also an outstanding match with blue jeans. From formal through to casual, a pair of shoes that can handle a wide range. 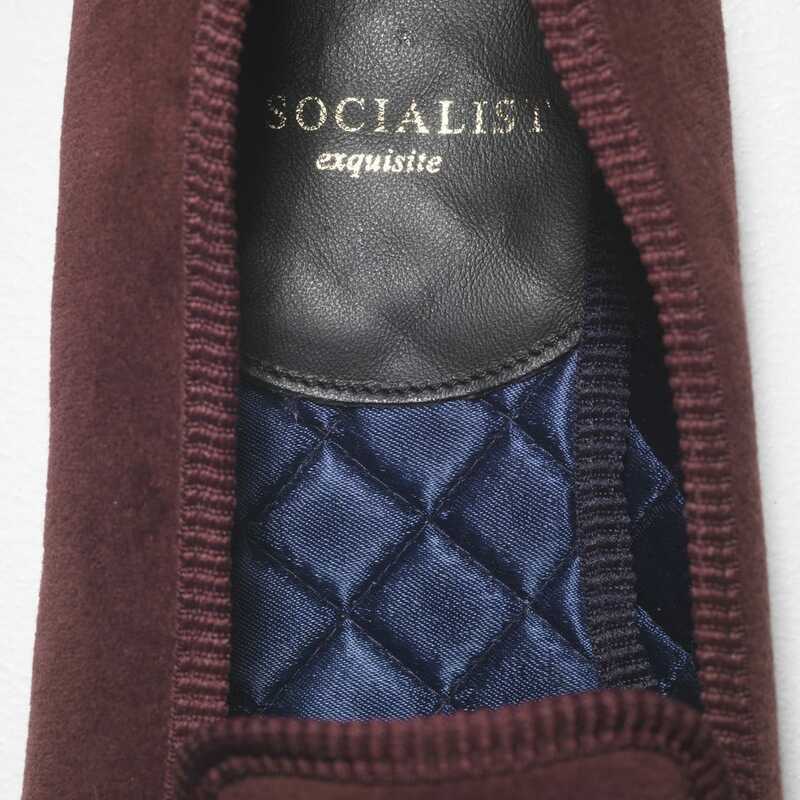 A Socialist’s room shoes are made in Norwich, the east of England, in a renowned factory with over 150 years of proud shoe-making history. 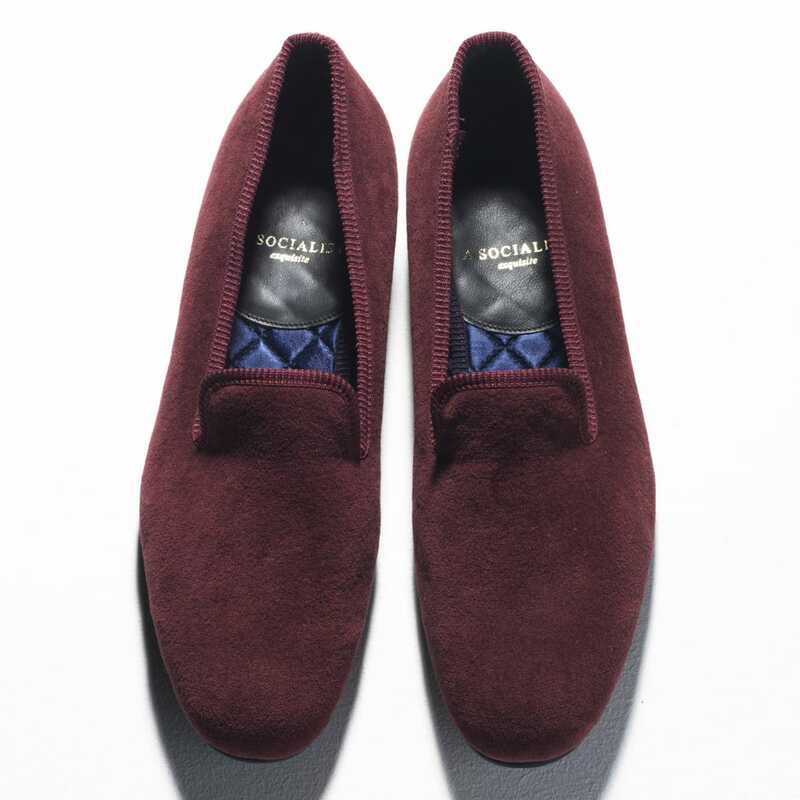 The design is an outdoor-ready arrangement of the simple slip-on originally ordered by Royal families and aristocrats for indoor wear.Each and every manufacturing process of the shoe is conducted by hand and the beautiful form and elegant sturdiness reveal a quintessential English quality.Eye catching, chic and adult: the maroon colored velvet is the perfect jab of color when coordinated with a black suit or tuxedo. Also an unexpected match with most color pants, notably suited to navy and grey. Lightly cushioned quilt material has been employed in the shoe lining. Wearing the shoes without socks in a spring and summer spirit is recommended. The load bearing heel is reinforced with leather and stamped with the brand logo. 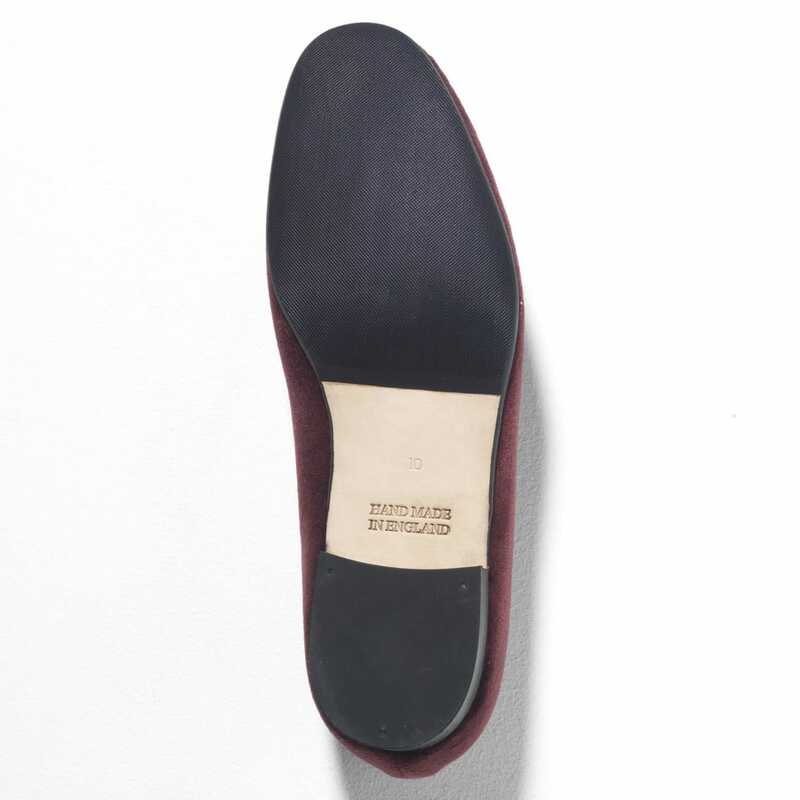 Grip and durability have been improved to a fault by affixing a rubber sole from the Vibram company in Italy. By this addition, room shoes which were never intended for the outside become perfectly suited to the outdoor surround. 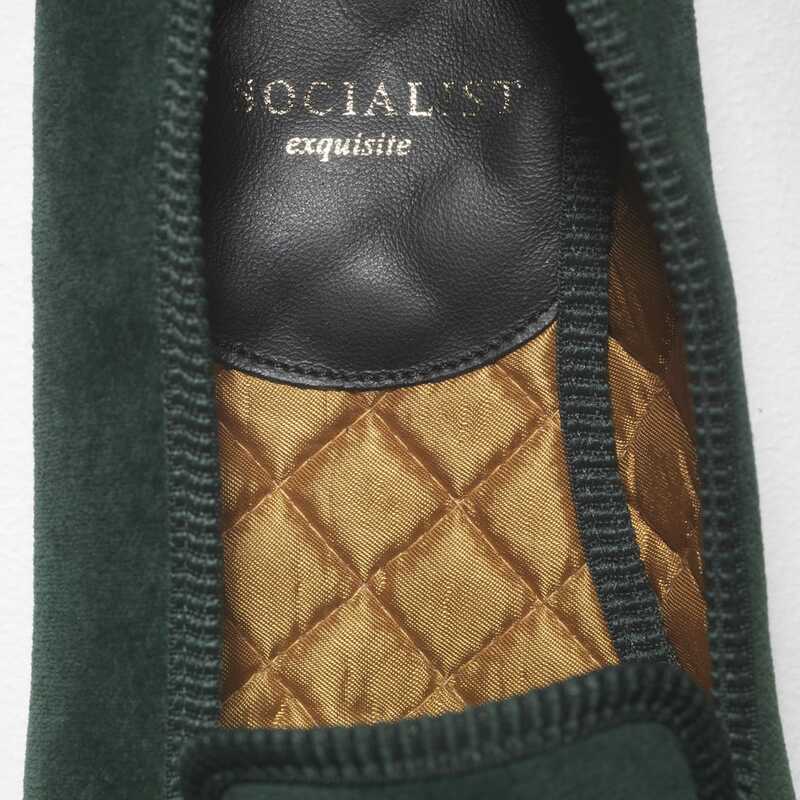 A Socialist’s room shoes are made in Norwich, the east of England, in a renowned factory with over 150 years of proud shoe-making history. 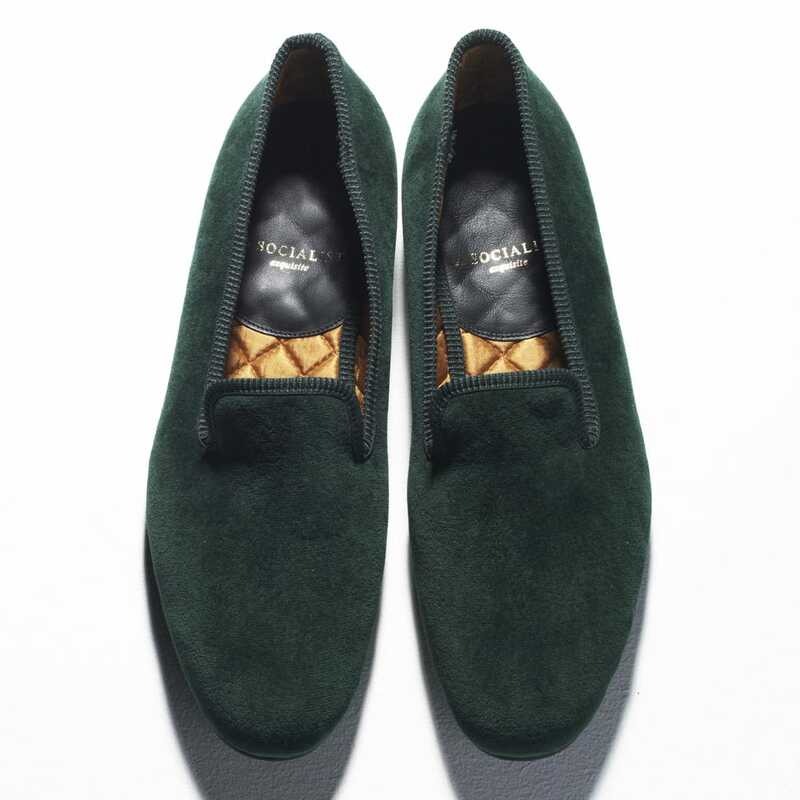 The design is an outdoor-ready arrangement of the simple slip-on originally ordered by Royal families and aristocrats for indoor wear.Each and every manufacturing process of the shoe is conducted by hand and the beautiful form and elegant sturdiness reveal a quintessential English quality.Velvet dyed in the legendary British Green color creates a calm adult air which matches well with faded jeans or grey pants. Copyright © 2015 A SOCIALIST All Rights Reserved.